I finally got to cook dinner last night! Its been such a busy week and it just hasn't worked out for me to make anything substantial in the kitchen. Sadly, my lack of cooking this week meant the sacrifice of two bunches of swiss chard...I had to toss their poor, limp, lifeless bodies into the trash last night. That will teach me...I hate to waste! Luckily when I opened the produce drawer I discovered that the broccoli rabe we picked up last weekend at Whole Foods had survived my brief hiatus. I've had broccoli rabe several times in restaurants, but I've never actually made it myself. 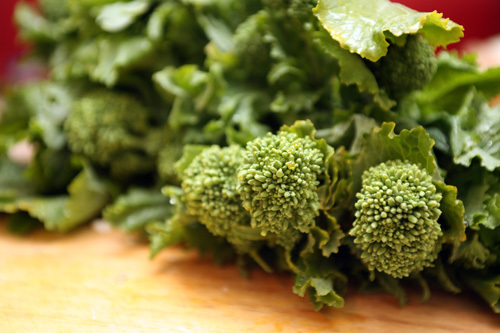 After doing a little research, I discovered that even though it is part of the broccoli family, and has a few similarities in appearance to broccoli, you actually treat it like leafy greens when cooking it. I was originally thinking that I would just cook up the broccoli rabe on its own and have it on the side of some glazed pan-fried tofu and a grain of some sort. That sounded a little boring until I remembered this article I had seen in the NY Times last week. I used it as a starting point for my pasta dish, but made plenty of changes and additions to be able to call it my own. The recipe has several steps, but its really not as complicated as it may look on paper. The squash goes in the oven first, and while it roasts you pan-glaze the tofu. 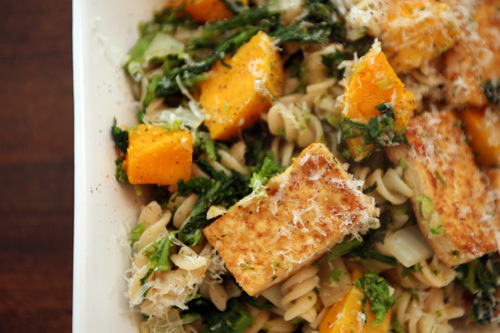 Once the tofu is ready, the broccoli rabe is parboiled, and the squash is removed from the oven. 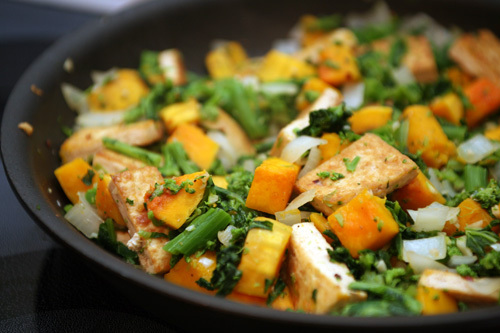 The onion and squash are added back to the pan that the tofu was just glazed in, with a little bit more olive oil. 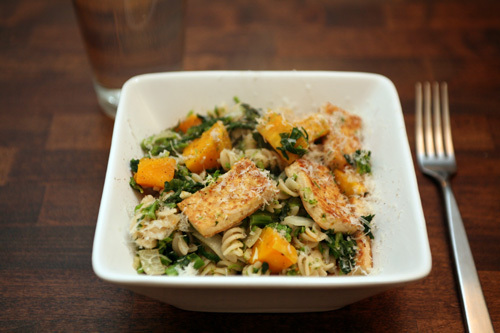 Its joined by the drained broccoli rabe and garlic, and then by the already glazed tofu. Meanwhile, your pasta is boiling and once drained, it gets tossed in the pan as well. Easy peasy. :) I do think it took about 45 minutes of prep time. Preheat oven to 400*. Place cubed butternut squash in small baking dish. Toss with 1 tbsp olive oil and salt + pepper to taste. Roast for 20-30 minutes, until squash is just starting to get tender. Meanwhile, pan-glaze the tofu (recipe below). While tofu is cooking, rinse broccoli rabe (BR) very well. Cut off tough ends of stems, about the last 2”, and discard. Chop remaining BR into 1/2” pieces. Check on your roasting squash, and remove from oven if starting to get tender. Bring large pot of water to a boil. Add the BR and boil for about 4 minutes. Use a slotted spoon to scoop BR out of hot water and into a bowl of very cold water. Reserve boiling water for the pasta. While the BR is resting in the cold water, reheat saute’ pan used for tofu and add 1 tbsp of olive oil. Add the onion and squash, saute’ for 5 minutes until tender. Add garlic. Drain and squeeze water from BR. Add to saute’ pan along with the glazed tofu. 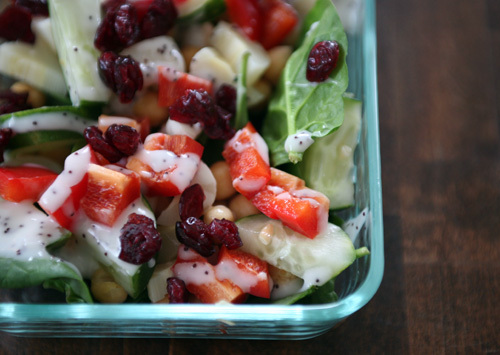 Toss all together for about 1 minute. Remove from heat but keep warm. Bring water back to a boil to prepare pasta. Boil pasta until al dente, about 9 minutes. Drain and toss with sauteed ingredients. Serve immediately, with parmesan sprinkled on top. Cut the tofu into roughly 1” x 1-1/2” x 1/2” pieces. Lay cut pieces across a few stacked paper towels. Lay a few more layers of paper towels on top of tofu and press water out gently with the palms of your hands. Repeat twice more. Heat olive oil in nonstick pan on medium. Add tofu pieces and let saute’ for 6-7 minutes, until golden brown on one side. DO NOT disturb the tofu before turning it over. Simply lay it in the pan and leave it alone until you check it for color after 6 minutes. When golden, flip tofu to other side. Let saute’ an additional 5 minutes on second side, without disturbing it. While tofu cooks, mix together all ingredients for the glaze. Check second side of tofu for color. 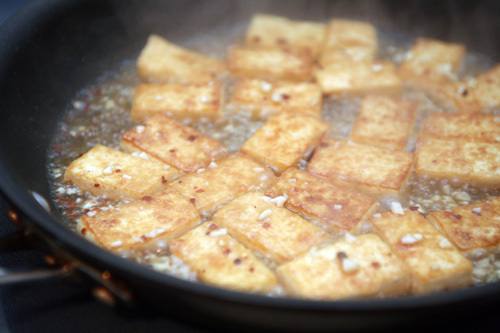 When golden, pour glaze into pan, stirring tofu to fully coat it. Allow to simmer for 3-5 minutes until glaze thickens and most of the liquid is gone. Remove tofu and pan from heat. Place tofu on a plate and set aside. Reserve the pan and any remnants of glaze for use in a few minutes. 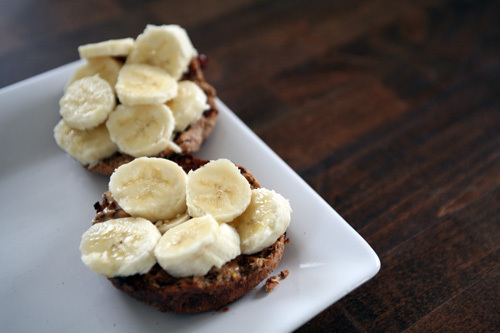 Breakfast: toasted Ezekiel cinnamon raisin muffin with 2 tbsp natural peanut butter and a sliced banana. 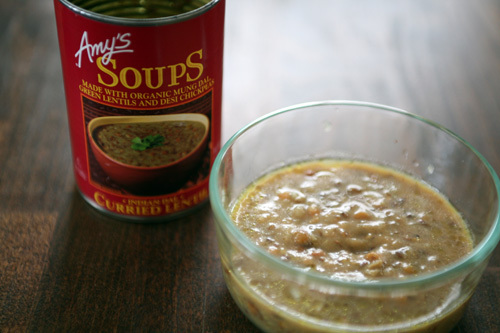 Lunch: 1 cup of Amy's Curried Lentil Soup and another lovely salad. The soup was really good, but way more calories than I normally look for in a soup. There are 230 cal/1 cup serving, and I typically look for that many calories total in the can. Snacks: a perfect tangelo at work and a handful of granola when I got home. And, THANK YOU ALL for your great comments about my foot injury! I am definitely thinking that it is plantar fasciitis, and am so angry with myself for getting off of my training last week and then pushing too hard last weekend to finish my long run. :( I've gotten great advice from you guys, from the 'net, and from a marathon-running friend of mine that has either seen or had every running injury in the book, so I'm hoping to recover soon. Its still really painful today, even after resting yesterday. I'm going to see how it feels tomorrow but if its still really sore I made hold off on doing my long run. I'm also going to go talk to my coach at the running shop and see if he has any advice for me and make sure that my shoes are still doing for me what they are supposed to be doing. And I've got a list of stretches to do, Advil to take and an icing routine in the evenings. Wish me luck!! !